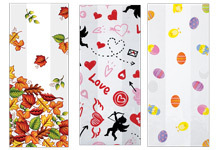 Printed Cello Bags for Birthdays, Valentines Day, Easter & Halloween. Cello bags in classic colors and polka dots with clear window center. 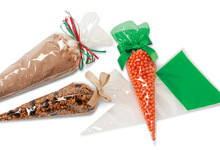 Unique cone shaped cello bags are a fun way to package your candy! Now On Sale! 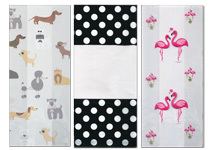 Stand up zipper pouch bags in everyday and seasonal printed designs! 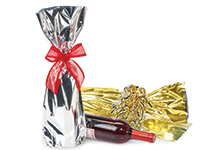 Metallic Wine Bags are a quick packaging option for wine bottles, candles and tall crafts! 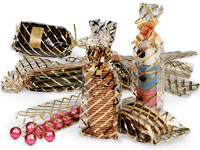 Clear cello treat bags with metallic gold stripes. 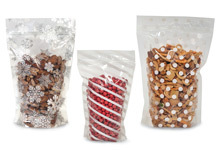 Holiday Cello Bags in festive designs are perfect for Christmas treat bags! 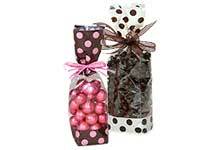 Cello Bags with printed designs for small favors or gourmet treats like candy, cookies, pretzels, popcorn, nuts & more. Hundreds of cello bag options with gussets for weddings, parties, baby showers and holidays including Christmas, Valentine's Day, Easter & more. 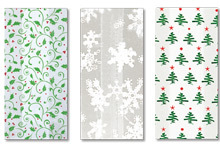 See our complete line of Clear Cello Bags & Coordinating Printed Cello Rolls.